I finally decided to use-up those overripe bananas that I mentioned in yesterday's blog about how we Brits throw away so many bananas. This tasty muffin recipe makes six delicious breakfast treats as well as a great snack for when you are rushing about and need a boost of energy. Instead of wasting those leftover bananas this weekend, try this! Start by making the topping. Put the linseeds in a blender or food processor and bend for 30 seconds. Put he self-raising flour in a bowl and mix in the butter until the mixture looks like fine breadcrumbs. Add the demerara sugar, linseeds and cinnamon, then stir in the water and mix well. 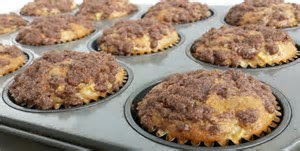 To make the muffins, mix the plain flour, brown sugar and baking powder in a large bowl, then make a hole in the centre. In another bowl, mix the eggs, milk and oil together, then pour into the centre of the flour mixture. 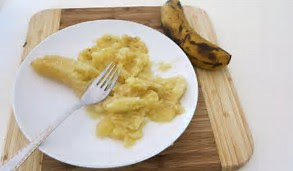 Stir until it is just mixed together, then stir in the bananas, but don't mix too much. 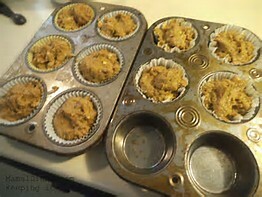 Divide the mixture between 6 paper muffin cases, then sprinkle a little of the topping over each muffin. 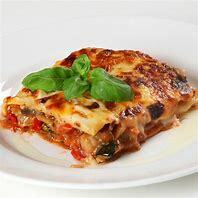 Bake in the oven for 25 to 30 minutes until firm.